These donut crafts are so much fun to make, they even look good enough to eat (and some of them you actually can eat)! Between donut origami boxes, donut gift bags and donut party platters, you may have a tough time choosing just one to make. Who doesn't love donuts?! They are sweet, tasty, and oh-so-cute! 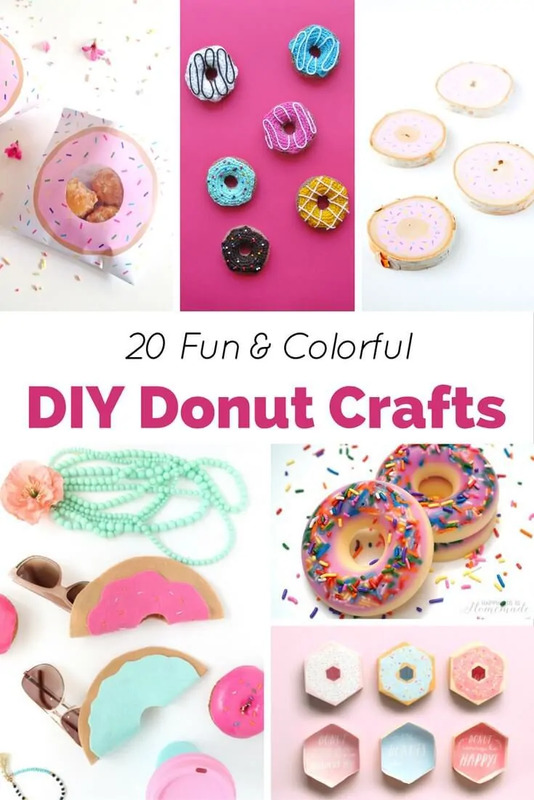 Below you will find a list of 20 awesome donut crafts that you can make to help celebrate your love for donuts! These donut valentines are so easy make, all you need is 10 minutes of your time to make them. How cute would Drizzled Donuts look in your hair? No, not like real donuts, but these donut hairpins look pretty close to the real thing. A Kailo Chic Life brings you a delicious donut edible, Mini Funfetti Pretzel Donuts. Giving and receiving donuts is lots of fun. Now, it is even better with this easy donut gift box from In the Playroom. What is better than donuts and tote bags? Donut tote bags, of course! Instead of giving someone a donut in the standard bag they come in, get creative and make this donut gift box. Little Things Blogged shows you how to make crochet donuts, with the icing too. Everyone loves donuts, and the Craft Hunter shows you how to make cute Donut Gift Bags using cello bags. Need a cute favor idea for a bridal shower or wedding? How about making some awesome Donut Soap Favors, courtesy of Bespoke Bride! Blog Beau Coup brings you an awesome idea for your next donut-themed party: Donut Party Garland! Want to combine your love of donuts and your passion for crafts? Check out this Donut Bouquet that is fun and simple to make. When you lay down your head at night after a long day, why not rest your head on an adorable handmade Donut Pillow? Who doesn’t love donuts, right? And who doesn’t need a cool idea for storing their jewelry? These Cookie Cutter Jewelry Trays are so cute for storing and displaying jewelry. Looking for a cute and unique party platter idea? The Well Kept Chaos brings you with DIY Donut Party Platter with Sprinkles. Wrapped Up in Rainbows shows you how to make this cute Felt Doughnut Collar. Happiness is Homemade brings you these Donut Scented Soaps. What is better than showering in the morning with soap that looks and smell like delicious donuts? Imagine how adorable Donut Coasters would look on your kitchen table or coffee table? You probably don’t need a constant reminder of your love for donuts, but this Donut Clock will help remind you anyways. What do you get when you combine paper plates, craft paper, confetti and yarn? You get this cute Donut Garland from My Poppet, of course. Here is another cute DIY donut pillow idea from Little Inspiration. There you have it. 20 Fun and Colorful DIY Donut Craft ideas. I hope you found a project or two that you want to make yourself. I would love to hear what donut crafts you plan on making in the comments below. What a cute collection of donut crafts! We have an art closet and art is so important in a kids’ life! What cute ideas! I think “donut everything” is in these days! Donuts and cupcakes! Those are absolutely adorable! What cute ideas! How cute.. I can use some of these for this summer to keep kids entertained. Thanks for the ideas. These are so cute! I am pinning this for sure. I would love to make the donut soaps. What perfect gifts these will make for teachers and neighbors! My granddaughter comes over every week to do some crafts or baking so this one would be so fun. Very clever. I think we would have fun. Donuts are a perfect design for crafts. There so much fun. It would be alot of fun making these donuts with My Grandchildren. I am sure they would enjoy decorating them. Your decorated Donuts look so pretty.. Colorful donut crafting ideas. Thanks for sharing. These donuts are so awesome. They are colored and decorated so Pretty & Yummy looking… This would be a lot of fun for me and my Grand kids Thank You for sharing.. I myself would love to make these cute Donuts. They are almost too cute to eat! lol! I love crafting in the kitchen, this right up my alley.. Thank You for sharing..